You cannot add "UCCNC software" to the cart because the product is out of stock. Alla våra priser är med moms. Om du jämför vårt pris med andra så har de flesta exkl moms. The Raw machines use Mach3 as default and the machine is designed for this program. You can use any program you want, but all functions we have such as calibration and ATC etc are only available for Mach3 at this time. We have released the 2nd version of Mach4. Check the availability of a motion control plugin for your device before buying. Motion control is available using our Parallel Port plugin or our Galil Plugin (licenses required). Vital Systems, PMDX, PoLabs,and CNC4PC, all have great motion control boards with plugins for Mach4 available from the associated links. Mach4 Information: Mach4 is our newest version of CNC motion control software. 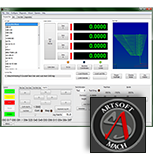 Mach4 is completely new software with less than 1% of the programming code in common with Mach3. It was written from the ground up to be expandable, flexible, and extremely responsive for use with very large files. Mach3 was designed for simple hobby machines and still serves this purpose well. When quality, speed, and the ability to use or learn industrial style controls and methods are what is needed, Mach4 is the correct choice. While there was only one version of Mach3, Mach4 is offered in different versions. Mach4 has been in use on Industrial equipment running constantly for over a year. The standard Mach4 installer will control mills, drills, lathes, and routers. While we are controlling other machine types with our Industrial software, complete hobby solutions with integrated screens and functions have only been completed for these machine types. Check back soon as more is coming.